Charges tossed out against woman who took dog waste drop box - KRV Legal, Inc.
Carrie Fosdale of Algonquin is criminally off the hook now that the McHenry County State’s Attorney has agreed to drop a theft charge against her. 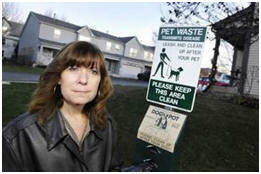 When her townhouse association wouldn’t move a dog waste container from near her home, she removed it herself. McHenry County prosecutors today tossed out the case against an Algonquin woman accused of swiping a dog waste receptacle from her townhouse association. Announcing the decision in court this morning, Assistant McHenry County State’s Attorney Demetri Tsilimigras said that it would not serve the ends of justice to pursue a theft charge against Carrie Fosdale. Instead he suggested Fosdale and the Old Oak Homeowners’ Association settle their ongoing dispute outside of criminal proceedings. The decision ends a chapter of a yearlong saga that began when the association installed a dog waste receptacle – a small container hung on a post with a sign stating its purpose and contents – about 25 feet from Fosdale’s home in the 900 block of Old Oak Circle. Fosdale, 46, said she repeatedly complained to the association about the container and asked them to move it elsewhere. When her request got no response, Fosdale decided to remove it herself, plucking the receptacle out of the ground and stowing it in her garage. That’s when police got involved. Acting on a complaint from the association, Algonquin police arrested Fosdale in November on a charge of theft under $300, a misdemeanor for which she faces a fine of up to $2,500 and even a year in jail. Fosdale attorney George Kililis said today he is glad cooler heads ultimately prevailed. “I know the state’s attorney’s office prides itself in winning cases, but I think in this case the office and Mr. Tsilimigras did the right thing and I applaud them for it,” Kililis said. Tsilimigras noted that it would have been difficult to prove an essential element of the theft charge: that Fosdale intended to permanently deprive the association of the receptacle. Judge Charles Weech also sounded happy to see the case land in the court’s version of a waste receptacle, saying the dispute probably never should have been brought to his criminal courtroom.